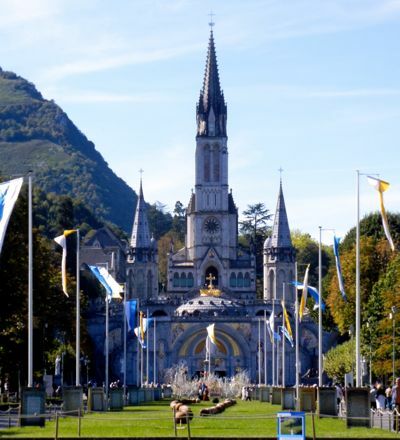 Built atop the Massabielle Grotto, the multi-tiered basilicas are the centerpiece of Lourdes. Young Bernadette Soubirous saw her visions of the Virgin Mary in the Massabielle Grotto in the winter and spring of 1858. According to the story, the Virgin asked that a chapel be built at the site to receive the faithful. A chapel was nowhere big enough to accommodate the pilgrims. A multi-story basilica greets visitors and dominates the town. At the top is the Basilica of the Immaculate Conception, or Basilique de L'Immaculée Conception, with its soaring tower. If you're wondering about the large brown balls on the lawn in front of the Basilica, that is the world's longest rosary, measuring 82.9 meters (271.98 feet), a Guiness World Record! 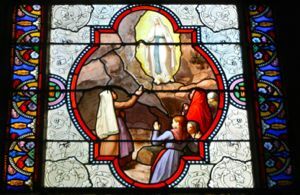 The Immaculate Conception Basilica contains beautiful stained glass windows that present the eighteen visions that Bernadette had of the Virgin, with brief explanations of each. Underneath the upper basilica are two other structures. The Crypt and the Rosary Basilica (Basilique du Rosaire). The Rosary Basilica was designed to be the base of the Immaculate Conception. Embraced by elliptical ramps, the approach across the parvis (the square in front of the church) is lovely and harmonious. The interior is decorated with mosaics and paintings of saints and religious scenes. 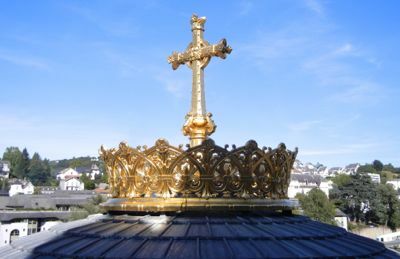 It is topped with a golden crown and cross. The crypt is the oldest structure and the smallest. It is used largely for prayer. Although crypts often contain sarcofagi, and one might expect Bernadette to be buried here, in fact she is not. She lived the last years of her brief life with the sisters of Notre Dame in Nevers, in the Burgundy region of France. She died in 1879 at age 35, apparently without benefit of Lourdes's healing. The Esplanade in front of the Basilica is the culminating point of the nightly Torchlight Marian Procession. Although the Immaculate Conception Basilica is very large, accommodating about 2000 people, it's not large enough for all the pilgrims who come to Lourdes. In 1958 the Underground Basilica of St Pius X was opened, with a capacity of 25,000. Above, Stained glass showing Bernadette's vision of the Immaculate Conception. 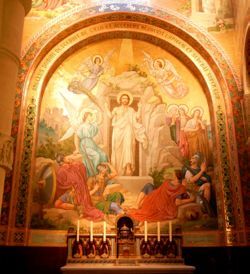 Below, Mosaics in the Rosary Basilica. 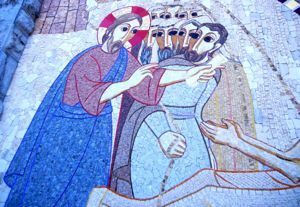 Above, Exterior Mosaic, Lourdes Basilica.